Vocals can add an organic touch to any track, and can really drive home the idea and message your song sends. Some tracks will sound empty without them, like something is missing. Vocal samples are one solution, but sometimes spending hours finding the right fit or the right lyrics just isn’t practical. In this tutorial, you’ll learn how to record vocals in FL Studio to give your track a unique sound. Note: You must have FL Studio Producer Edition or higher to record audio and vocals. If you already have all the hardware you need, just skip to Step 2. If not, there are tons of great microphones and accessories online. Much of your selection will depend on how much you can afford, and how much you’re willing to pay for high-quality recordings. Full Disclosure: The following links are affiliate links. Buying from any of these links will earn me sales commission. For those of us on a budget and wanting versatility for use in and out of the studio, the Digital Reference DRV200 or Behringer Ultravoice Xm8500 are both solid choices. If you’re looking to spend a little more, a higher-end cardioid condenser mic like the Audio Technica AT2020, MXL 770, or MXL 990 are also good options. Just be considerate of whether or not your selection will require a phantom power source. Next, you’ll need a boom or stand to hold your mic. Again, there are loads of selections online. I purchased a pretty cheap mic boom from Neewer. It clamps to my desk and is very easy to set up and adjust. There are also some high-end models out there like the RODE PSA1. Make sure that your desk thickness is less than the maximum clamp opening depth, or the boom clamp won’t fit. My gear for recording vocals. 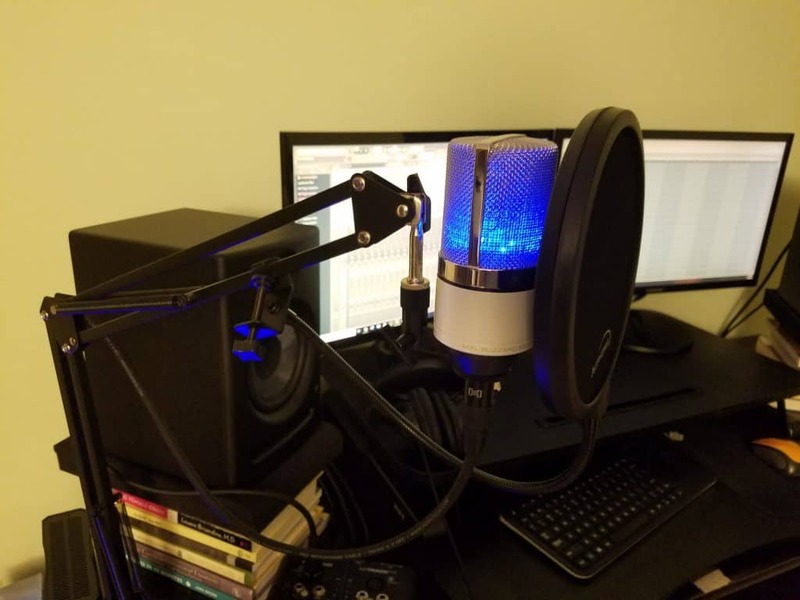 This is the MXL 990 Blizzard Edition, scissor boom mic stand from Neewer, and pop filter from Auphonix. A set of headphones may also be necessary for the vocalist to wear during recording. If you’re recording and monitoring in the same room, these will allow the vocalist to hear the track during recording while preventing the track from being recorded by the mic. The Sony MDR7506 is my personal choice, but cheaper alternatives will also do if you’ll just be using these to record vocals. You will need an XLR cable to connect your mic to your audio interface, unless your mic uses a USB connection or you have an XLR to USB adapter. It is also worth investing in a pop filter. Pop filters stop pops in your recordings that are caused by fast-moving air running into your mics internal components. All of these decisions will depend on what degree of quality you’re willing to pay for for your vocals. 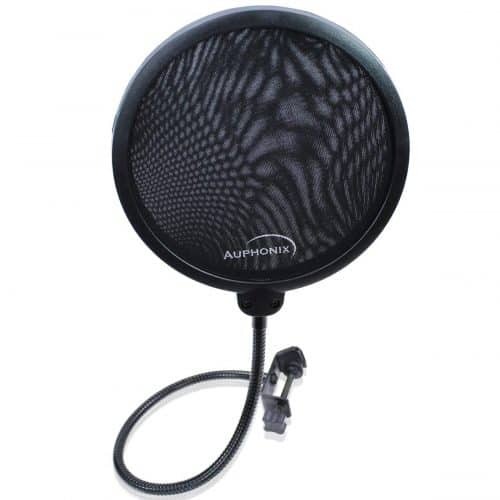 A nice pop filter from Auphonix. OK, now that we’ve covered everything we need, lets look at Step 2. To record vocals in FL Studio 12, we need to make sure we are using an ASIO driver. To access your driver settings, just go to Options, then Audio settings, and under Input/Output devices, choose an ASIO driver. If you don’t have an ASIO driver, you can download one here. Latency is the time it takes for the live voice coming from your mic input and/or the data coming from FL Studio to be processed by your computer. You want to make sure that latency is as low as possible. A very high latency will lead to vocals that are out of sync with the rest of the track, and can make recording difficult for the vocalist when recording over a live mix. You can reduce latency by reducing the audio device buffer size. A rule of thumb is under 11 ms for latency. If you cannot achieve this without buffer underruns, it may be time for a faster processor. 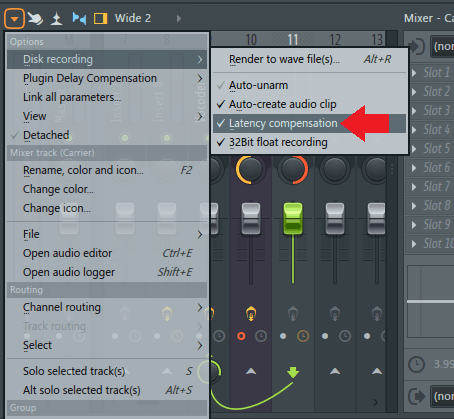 Another way to help with latency issues is by turning on Latency compensation in your Mixer options under Disc recording. This removes your audio input device’s buffer latency time from the beginning your recorded audio clips so your vocals sync up with the rest of your track. 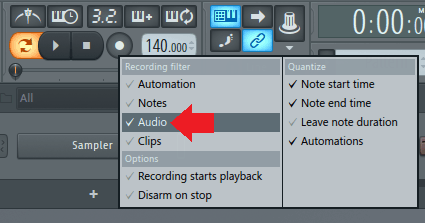 Right-click on the Record button in your top toolbar and make sure the Audio option is checked. This will allow you to record directly into the Playlist. Once your mic is connected, you need to tell FL Studio where the mic input is coming from and what to do with it. Choose any Mixer track for your audio to come from, just not the Master track. At the top of the signal processing chain, set your Audio input source to the device your mic is connected to. There should be two sections, one for stereo and one for mono. Stereo will record in one stereo track (left or right) unless you’re using a stereo mic, and both mono options will just record copies of the same signal in mono for both left and right. In the vocoder setup below, the modulator is the mic input panned hard left, and the carrier is a synth preset panned hard right. There are actually two ways to record vocals in FL Studio. The first way is into the Playlist as an audio clip. The clip will also be present in the Channel rack. This method saves a file of the recording on your computer in the Recorded folder in the Browser/plugin picker by default. First, we want to make sure the Mixer track that you have your mic input routed to is armed for recording. When you chose your mic input, FL Studio should have auto-armed the Mixer track. You can check by looking at the Mixer track and making sure the red Arm disk recording button is lit up. Just click it to toggle on and off. You can also right-click to choose a different folder directory to save your audio clips to. This is where we adjust the mic input peak level to -10 dBFS. We can do this by adding a Fruity Balance to the top of the mic input Mixer track signal processing chain. We’ll run through this same process in the next section on recording with Edison. Next, click the Record audio button at the top main toolbar, and hit Play. You can now start recording your vocals! When you’re done, just click Pause or Stop and the recorded audio clip will appear in your Channel rack and Playlist too, if you’ve recorded in Song mode. The second way we can record vocals in FL Studio is with Edison in the Mixer. Edison is an audio editing and recording plugin by Image-Line, and comes with FL Studio Producer Edition and up. It allows for more control when recording and is better suited for sampling than recording into the Playlist. First, add an Edison to your mic input Mixer track. Make sure it appears above any effects you have added on to the track. This will ensure that you have a “dry” recording, which will allow for more control and flexibility in your mix later on. Edison should appear above effects in your signal processing chain. To reorder, hover over a slot and scroll with your mouse wheel. Next, you want to make sure the mic input signal coming into Edison is a maximum of -10 dBFS. You can achieve this by having your vocalist do a few test runs with proper distance from the mic and the loudness of their voice taken into consideration. Adjust your mic input gain so that the loudest parts of the test run are around -10 dBFS. 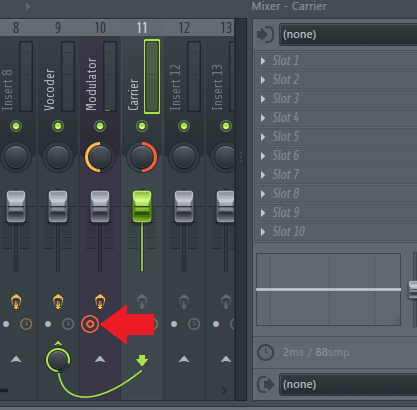 As mentioned earlier, you can do this by adding a Fruity Balance and a Wave Candy above Edison in the Mixer track. Adjust the gain on Fruity Balance as your vocalist is performing while simultaneously monitoring the Wave Candy meter until the loudest parts are around -10 dBFS. Next, hit the Record button in Edison. If you have the trigger set to On Input, Edison will automatically start recording once it senses an input signal. Click the Record button again to stop recording. From here, you can edit the recorded waveform, it’s volume, panning, and stereo separation envelopes (bottom left), normalize, add EQ, slice, etc. Once you have the waveform sounding the way you want, just click the Send to playlist as audio clip/to channel button at the top right in the Edison toolbar. Now, your clip is in the Playlist and Channel rack. Recording vocals with effects applied (wet) is not recommended. You can’t remove effects that you’ve recorded along with the vocals. You can always add effects to your vocal audio clips afterwards. If you are monitoring and recording in the same room, remember to make sure your studio monitors are off before recording. You want to isolate the vocalist’s voice as much as possible during recording. Headphones and a good acoustic treatment setup will really help here too. Aim for -10 dBFS peak level when recording vocals. Sometimes, shooting for -12 dBFS is ideal because vocalists will tend to sing louder than normal when recording. And that wraps it up for this one. If you liked this 100% free FL Studio tutorial, let me know what else you’d like me to cover in the comments, on the Synaptic Sound Facebook page, or YouTube channel! Good question… it may be possible if you change your Input/output device under Settings > Audio settings to your computers original driver. If not, you may be able to record your voice in Audacity or other free editing/recording software, and then import into FL Studio. Hope that helps! lot. I’m hoping to offer one thing again and help others such as you aided me.